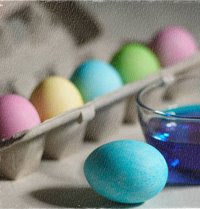 Natural Easter Egg Dye. Chemical-Free. Plant-Based. Other ingredients for dyes: blackberries, concord grapes, pomegranate, strong coffee or espresso, blood oranges, cherries, paprika, portobella mushrooms. Hard boil the eggs and let them cool. For each color, boil 3 cups of water, 2 tsp vinegar and one of the vegetable ingredients for 30 minutes. The orange peels create a pale yellow-orange, beets create pink, turmeric root a deeper yellow, spinach makes a spring green, and red cabbage makes blue.